Every morning the Tomten steals an egg from Henny's nest, then runs away to cook it in his little kettle and gobble it down for breakfast. Henny doesn't like the Tomten taking her egg, but she doesn't do anything -- until one day when a goose swims by with a new brood of little goslings. Then Henny wants chicks of her own. How will she ever get the Tomten to stop stealing her eggs? With the help of her friend Hedgie, the little hen finally gets to keep her eggs through a sharp and clever plan that in the end surprises even Henny. 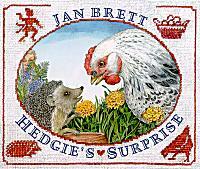 Beloved best-selling author Jan Brett captures the mischievous nature of a Danish Tomten, along with Henny and that favorite hedgehog, Hedgie. Luminous watercolors, complete with intricately patterned needlepoint borders, capture the humor and playfulness of the tale as well as the beauty of a Scandinavian farm.